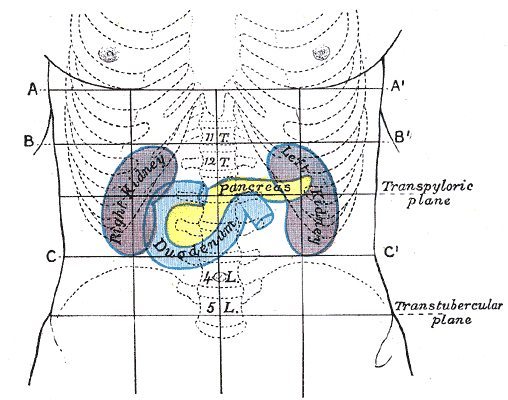 The pancreas is a mixed exocrine and endocrine organ that is located in the retroperitoneum in the upper abdomen. It is a firm, fleshy organ that has a yellow lobulated cut surface. The weight of the pancreas is in the range 50-150g and the length is around 150mm. The pancreas has several parts: the head, neck, body and tail. The neck connects the head of the pancreas to the body of the pancreas. The body is approximately triangular in cross section and thus has three surfaces: anterior, posterior and inferior. It crosses in front of the vertebral column. The tail is a continuation of the body and extends to the left of the vertebral column, towards the spleen, to which it either approaches very close or actually touches. The pancreas is located behind the stomach, the mesocolon of the transverse colon and sometimes the transverse colon. The splenic vein runs behind the tail and body of the pancreas. It unites with the superior mesenteric vein behind the neck of the pancreas to form the hepatic portal vein. The left kidney and left adrenal gland are also situated behind the body and/or tail of the pancreas. The aorta and inferior vena cava are positioned behind the head/neck of the pancreas. This also brings the pancreas into close proximity with the various autonomic nerve plexuses of the posterior abdominal wall. The blood supply of the pancreas is from the anterior and posterior superior pancreaticoduodenal arteries, which are branches of the gastroduodenal artery (which is itself a branch of the common hepatic artery) and the anterior and posterior inferior pancreaticoduodenal arteries, which are the contribution of the superior mesenteric artery to the cause. The veins correspond to the arteries. The bulk of the pancreas is formed by its exocrine component. This follows the acini and duct arrangement for a glandular organ and this configuration of acini imparts the lobulated appearance to the cut surface of the pancreas. 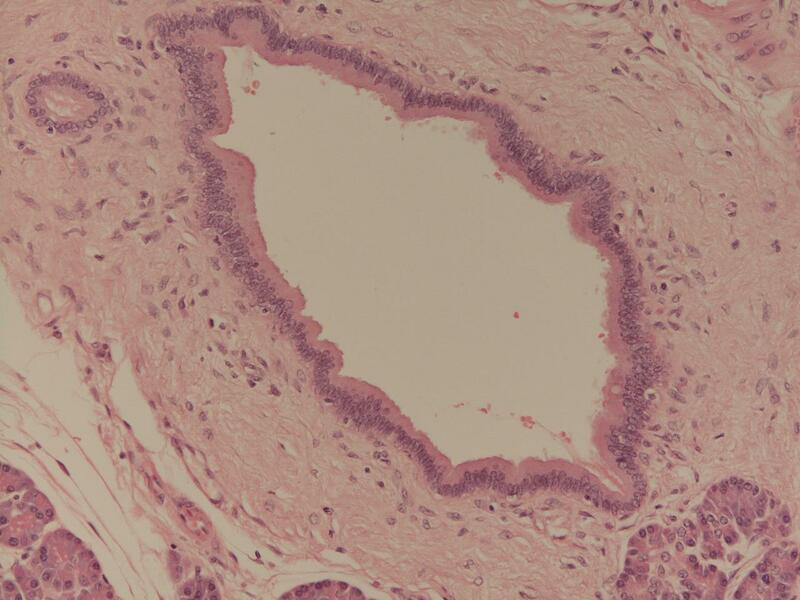 The acini are composed of columnar to pyramidal-shaped cells which have basally located nuclei. They contain red zymogen granules. The cells are closely packed within the acini and the acini themselves are also closely packed relative to each other. 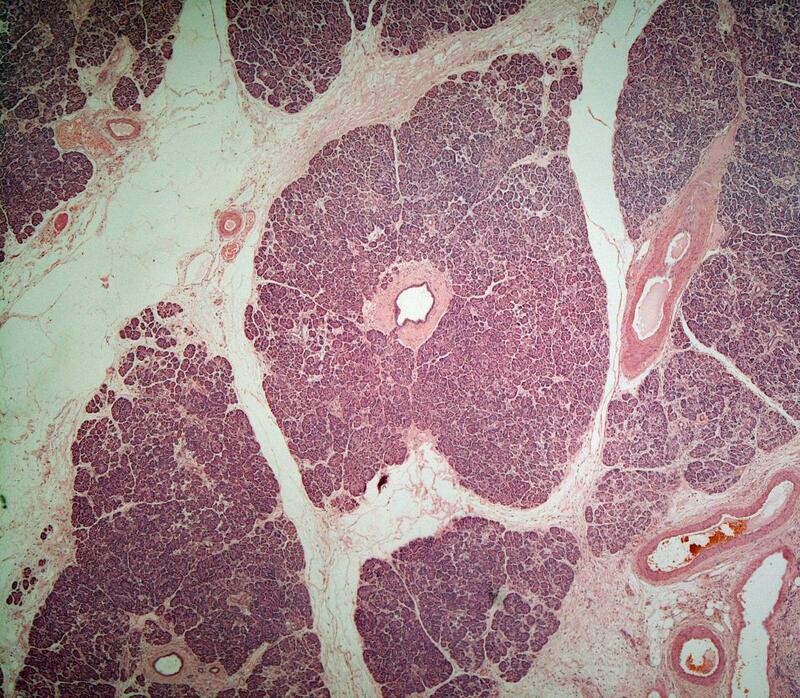 The acini are gathered around ducts which are lined by columnar epithelial cells. 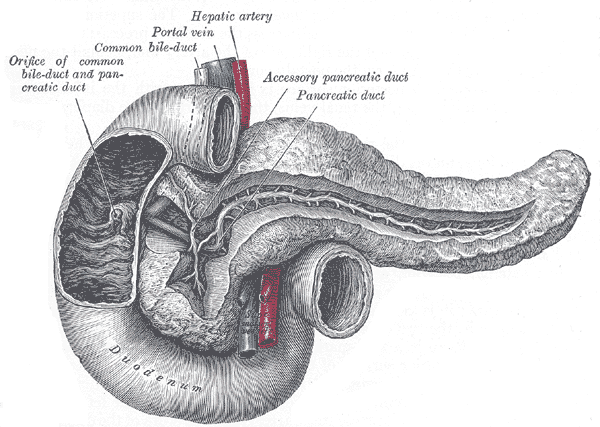 The ducts drain into the main pancreatic duct that runs along the pancreas from the tail to the head and is visible macroscopically. The main pancreatic duct unites with the common bile duct just before the ampulla of Vater and empties into the second part of the duodenum via the ampulla. It is not unusual for part of the head of the pancreas to possess an accessory pancreatic duct that opens into the duodenum separately. A lower power view of lobules of pancreatic acini. A duct is present in the centre of the image. The endocrine portion of the pancreas is composed of the islets of Langerhans. 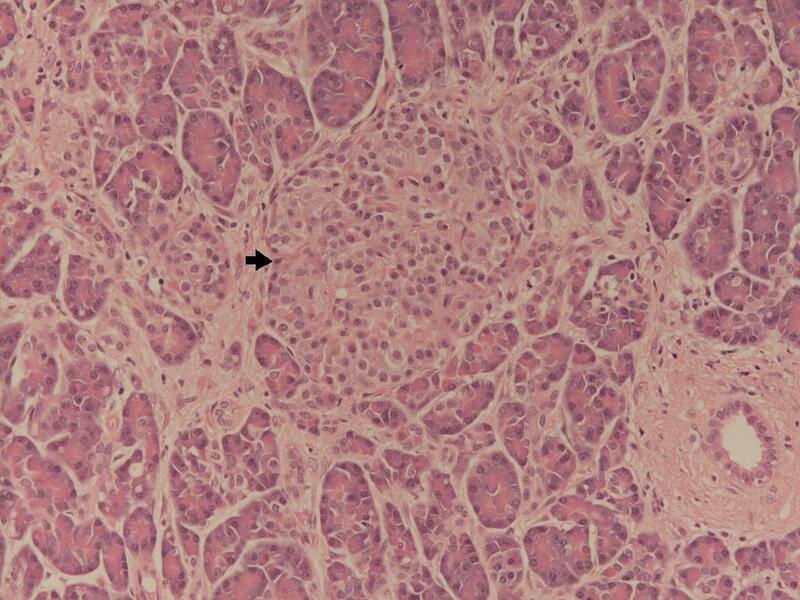 These are small groups of ovoid endocrine cells which are scattered amongst the pancreatic exocrine acini, particularly in the body and tail of the pancreas. The pancreas possesses a total of around one million islets. Each islet is 100 to 200 micrometres in diameter. The total mass of the islets is in the vicinity of 1000 to 1500mg. The islets of Langerhans contain several different types of cell: alpha (20%), beta (68%), delta (10%), PP (2%) and rare serotonin producing cells and D1 cells. Like other endocrine tissues the islets of Langerhans have a rich blood supply and secrete their hormones directly into the blood. In the embryo the pancreas develops from an anterior (ventral) and a posterior (dorsal) bud that arise from the nascent GI tract; the ventral bud is actually derived from a larger bud which will become the liver and biliary system. The two buds rotate and fuse by around 7 weeks. As with most organs and structures thare are formed by fusion and rotation during embryogenesis the potential exists for things to go awry and some people end up with ectopic pancreatic tissue, a divided pancreas (pancreas divisum) or an annular pancreas that is wrapped completely around the duodenum and can narrow the lumen of the duodenum. The function of the exocrine pancreas is to provide many of the enzymes that are integral to the chemical digestion of food in the lumen of the small bowel. The pancreas produces enzymes which digest fats, proteins and carbohydrates. The contribution of the pancreas to the digestion of fats and proteins is particularly important; the small intestine produces its own enzymes for the digestion of carbohydrates. The two main protein-digesting enzymes of the pancreas are trypsin and chymotrypsin, fats are digested mainly by pancreatic lipase, while amylase is the pancreas's contribution to carbohydrate digestion. The pancreas synthesises the digestive enzymes in inactive zymogen form (thus the pancreas actually makes trypsinogen and chymotrypsinogen). The enzymes are only converted to their active form when they reach the lumen of the small bowel; the enzyme enteropeptidase does the honours for trypsin, which can then active chymotrypsinogen and any remaining trypsin. The pancreas secretes these enzymes in a water-based fluid that is rich in bicarbonate. The bicarbonate is necessary to help the small bowel neutralise gastric acid. The pancreas produces approximately 1-2 litres of this fluid per day. The function of the islets of Langerhans centres around the regulation of glucose metabolism. The major pancreatic hormones which participate in the control of glucose metabolism are glucagon and insulin. The PP cells of the islets of Langerhans constitute only a small minority of pancretic endocrine cells. They secrete pancreatic polypeptide which stimuates the secretion of other gastrointestinal enzymes that facilitate digestion. The D1 cells manufacture vasocative intestinal polypeptide. Glucagon is made by the alpha cells in the islets of Langerhans. It is a protein hormone that contains twenty-nine amino acids. Its basic function is to raise blood glucose. Glucagon stimulates gluconeogenesis and glycogenolysis in the liver and also stimulates lipolysis in adipose tissue. It employs cyclic AMP as its second messenger. The release of glucagon from the islets of Langerhans is triggered by a low blood glucose or increased activity in the sympathetic nervous system, including the adrenal gland; a rise in the concentration of amino acids in the blood also promotes the release of glucagon. Insulin is a protein hormone that is synthesised by the beta cells of the islets of Langerhans and contains fifty one amino acids; the insulin molecule is composed of two polypeptide chains which are linked by disulphide bridges between cysteine molecules. Insulin is an anabolic hormone that is popularly conceptualised as a hormone that lowers blood glucose. The effect of insulin on blood glucose is important, but its actions are considerably more diverse and may be summarised as allowing the body to make best use of an influx of nutrients and to store them for future use. The ability of insulin to reduce the concentration of blood glucose is due to several actions. Insulin increases the uptake of glucose by various tissues, especially skeletal muscle and mature adipose tissue. This is accomplished by causing the cells to increase the expression of a glucose transporter that allows the cells to take up glucose. Once the glucose is inside these cells its phosphorylation traps the glucose inside the cell (this does not apply to hepatocytes). Insulin also induces the synthesis of glycogen, which further promotes the storage of glucose by cells, especially in the liver. The rate of hepatic gluconeogenesis is reduced. The uptake of fatty acids by adipose tissue is increased by insulin and the rate of release of stored fats from adipose tissue is decreased. The adipocytes are stimulated to convert the fatty acids into triglycerides. Protein metabolism is also affected by insulin. The uptake of amino acids is promoted and this can lead to an increase in the rate of protein synthesis. The breakdown of proteins is suppressed by insulin. Insulin also stimulates the entry of potassium into cells. This action is employed in the treatment of hyperkalaemia. Cells are protected against autophagy by insulin. There is biological consistency to this effect because it is inefficient for insulin to promote an anabolic situation only for cells to undo the good work by autophagy. Insulin also has a vasodilator action. The release of insulin from the pancreas can be triggered by various stimuli. A raised blood glucose promotes insulin release, but so does an elevation in the concentration of amino acids or fats in the blood; all of these events imply that the body is digesting a meal and is providing an influx of nutrients which need to be used and stored. The role of insulin in allowing the body to handle a meal correlates with the ability of cholecystokinin, secretin and gastric inhibitory polypeptide to stimulate the release of insulin. All of these hormones are produced in response of the delivery of a meal to the small bowel and the imminent surge of nutrients into the blood. Growth hormone also stimulates the release of insulin. This is a reflection of the anabolic effects of growth hormone and also helps to balance the hyperglycaemic actions of growth hormone (which nevertheless dominate in acromegaly). Despite being a hyperglycaemic hormone, glucagon also increases the release of insulin. This may prevent overshooting of the hyperglycaemic response to glucagon. The parasympathetic nervous system stimulates the release of insulin while the sympathetic reduces it. Circulating catecholamines also suppress the release of insulin. Somatostatin reduces the release of insulin and glucagon. It is synthesised by the D cells of the islets of Langerhans but also by the small bowel.